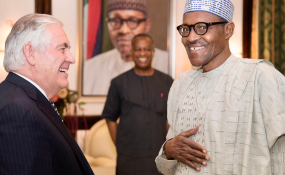 President Muhammadu Buhari met American Secretary of State Rex Tillerson at the presidential offices at Aso Rock, Abuja, on Monday. "The recent kidnapping of 110 schoolgirls is heartbreaking," Tillerson said on his arrival in the capital Abuja on the final leg of an African tour. "Nigeria has the US in full support and we are actively working with our partners in what we can assist you in this fight." Tillerson, who was greeted by Nigerian President Muhammadu Buhari, is on the final part of his first tour of Africa since becoming secretary of state. He arrived from Chad, where he also promised support for a state fighting jihadism. His tour, which began last Wednesday, has also included Ethiopia, Djibouti and Kenya. Parallels were immediately drawn to the abduction of more than 200 schoolgirls in Chibok in 2014, which captured world attention and contributed to the ouster of Buhari's predecessor, Goodluck Jonathan. Tillerson had initially been scheduled to stay in Abuja overnight, hold further meetings on Tuesday with US embassy staff and then fly back to Washington. But the schedule was shortened because of work and Tillerson will leave after a few hours, aides said.